The implications of the Panama Papers suggest the ignorance of a much more expansive concern and reality: the ongoing corruption that is hugely embedded in Latin American democracies. While the banking system in Panama is being investigated and that country's reputation is in jeopardy, there has not been much explanation and investigation about the Latin American leaders and high profile officials that have been involved in the scandal. The Panama Papers, the historic massive leak of documents exposing potential tax evasion and misuse of financial accounts, struck the entire globe this past April 4. The world turned its attention on the Panamanian law firm involved, Mossack Fonseca. In a blink of an eye, Panama was in the spotlight and the country was threatened to be included in a blacklist of tax haven and money laundering countries, which would "deal a heavy blow to Panama's vital financial services sector." But the implications of such events suggest the ignorance of a much more expansive concern and reality: the ongoing corruption that is hugely embedded in Latin American democracies. While the banking system in Panama is being investigated and that country's reputation is in jeopardy, there has not been much explanation and investigation about the Latin American leaders and high profile officials that have been involved in the scandal. For the purpose of this analysis, data collected in 2015 by Transparency International, a credible organization that leads a global coalition effort against corruption, will be used. This organization works around the globe to evaluate each nation's elected officials and their abuse of power for private gain. It focuses on a nation's 'transparency': shedding light on government deals, law enforcement compliance, and illicit practices of businesses. The organization uses a scale from 0 (highly corrupt) to 100 (very clean) to rank each individual nation. The information subsequently obtained depicts evidence that Latin America as a whole has an immensely large issue with corruption in government. Although corruption is not a new foe for the hemisphere, there has been no strong attempt to systematically eradicate this formidable issue. Even though these Latin American governments are elected both democratically and legitimately, the exposure of the Panama Papers makes it possible to bring the required attention to reveal this systematic issue in the hemisphere as a whole. This leak further highlights the need to depurate corrupted governments in order to push for more legitimate democracies in the region. In the ledger of Panama's current president, Juan Carlos Varela, the president has vowed to uphold a strong anti-corruption agenda for the country. According to Transparency International, Panama has a corruption score of 39/100, indicating that the nation deals with high levels of corruption within its public sector. Since Varela's term began in 2014, he has sworn to "unmask" corrupt members of the previous administration including former president, Ricardo Martinelli. Throughout his term, Varela's administration has managed to investigate and detain businessmen and high profile public officials, mostly accused of embezzlement. The authors of this analysis have previously contended in a recent publication in the Washington Report on the Hemisphere that, "It is believed that the political and financial machinations of the Martinelli administration were responsible for the growth in corruption levels, yet it was not until his term ended that the evidence began to fully surface." Moreover, Panama was ranked poorly in the Financial Action Task Force on Money Laundering (FATF) grey list due to inefficient procedures that labeled the country as non-cooperative, although they were recently delisted. A Wilson Center event on "Panama: Combating Banking Secrecy through Financial Transparency" on April 14 revealed as an eye opener to the legal progress that the Central American country has achieved since the inauguration of President Varela. Ivan Zarak, Panama's Vice Minister of Finance, contended that some of Panama's recent major accomplishments regarding transparency includes negotiation with potential partners regarding the exchange of relevant tax information. Furthermore, he explained that Panama has passed many laws to comply with international standards and follows due diligence procedures. This evidence shows the Panamanian government's efforts to shift their banking system away from corruption that existed under previous administrations and their efforts to be more transparent according to international standards. According to Chip Poncy, senior advisor of the Center on Sanctions and Illicit Finance (CSIF) at the Foundation for Defense of Democracies, "the delisting of Panama from the FATF grey list is a great accomplishment." He continues, "This is a country that was grey listed under a number of strategic deficiencies […] less than three years ago, on June 2014." He also contends that in the 11 years of working in the field he had never seen a country accomplish a delisting in less than two years as Panama did, establishing the country's exponential betterment in financial transparency. This increase in financial transparency is ignored or under represented within popular media and institution reports in regards to the Panama Papers scandal. Panama has not only been facing corruption-reducing attempts, but is now the center stage of the biggest corruption scandal in history. This presents a new challenge to the Central American country in the eyes of the international community. The country has been labeled as a tax haven and its banking system has been questioned. But the real issue goes beyond Panama, and the world is failing to notice this. While worldwide attention is focused on this country, the endemic corrupted politics of the hemisphere continue without resolve. The Panama Papers represent much more than a scandal for this country since it exposes how an unaddressed problem is undermining progressive attempts in the hemisphere. Corruption is continuously crippling democracy. It is essential to analyze how this phenomenon has been embedded in the region long enough for the severity of the issue to be diminished; causing long-term implications to each Latin American country. Hence, the analysis of hemispheric states being corrupt is of great importance, as is the need to enhance anticorruption policies that will address it. Chile has widely been known for its recent progression towards the elimination of corruption within its government. This is evident through Transparency International's corruption score, which ranked Chile at 70/100. The evaluation from 2015 indicates that in contrast to its neighbors, Chile has an insignificant amount of corruption within its public sector. However, recent reports indicate that corruption is beginning to seep badly. Corruption in Chile is not a new concern. In fact, the South American country has had a series of scandals pertaining government leaders and high profile individuals. Augusto Pinochet, former President of Chile (1974-1990), was accused of embezzlement of government funds, money laundering, bribery, and tax fraud, among other charges. Additionally, his son, Augusto Pinochet Jr., was involved with such scandals as the Pinocheques scandal of 1989, in which an investigation took place to address the origins of alleged checks that were destined to purchase a rifle company. The suit was dropped in 2010 with no results. High profile officials were arrested for the misuse of government funds used to finance political campaigns for the Party for Democracy deputies. Furthermore, Senator Guido Girardi, a member of the same political party, was accused of financial fraud when it was discovered that campaign expenses were justified under false bills from a nonexistent company, Publicam. Such events depict a persistent trend of corruption embedded in the Chilean government for decades. This is even more concerning given the fact that Chile was ranked as the second least corrupt country in Latin America by the 2015 report of Transparency International. Today, as exposed by the Panama Papers, corruption in Chile appears to continue. Brazil has also been deeply embedded in political scandals involving a series of corruption cases. Transparency International's 2015 report ranks Brazil's corruption score at 38/100, indicating that the nation's public sector is perceived to be corrupt at a high scale. Senior Research Fellow at the Council on Hemispheric Affairs, Mark S. Langevin, describes the severity of these issues within an analysis of Brazil's most recent events, "Brazil's crisis is compounding and threatens to drive the recession deeper and drain the political conditions for governability. The government's capacity to respond to the recession and its fiscal crunch is nearly exhausted by the rush toward presidential impeachment and fueled by the Lava Jato (Car Wash) corruption investigation and prosecution." Adding to the chaos taking place, the release of the Panama Papers earlier this month, linked politicians from seven political parties in Brazil. The files leaked included names from one of Brazil's major political parties, the Partido do Movimento Democratico Brasileiro (Brazilian Democratic Movement Party, PMDB), who have left President Dilma Rousseff’s coalition and members of the opposition party. Furthermore, International Business Times reported that 57 individuals associated with the Petrobras bribery scheme and money laundering investigation have opened 107 offshore companies through the law firm, Mossack Fonseca. Brazil continues to find itself in a web of corruption, undermining the possibility of establishing a corruption-free democratic government in the near future. The Argentine government is no stranger to being the center of corruption scandals. Transparency International's 2015 report ranks Argentina's corruption score at a staggering low of 32/100, indicating that the nation’s public sector contains several elements of corruption. Economic policies and political rhetoric have changed with time and administrations, but government corruption remains a constant within the Argentine political system. Former President Cristina Fernández de Kirchner faced charges claiming that she allegedly derailed a criminal investigation regarding the historic occasion in 1994 when the Jewish community center was bombed in downtown Buenos Aires. Prosecutor Alberto Nisman accused Kirchner of attempting to cover up for the Iranian government's role in the deadliest terrorist attack in Argentina's history. Nisman's criminal complaint was made public, four days before he was found dead with a gunshot wound to his head afflicted in his Buenos Aires apartment. He was scheduled to present his evidence to Congress the very next day. Nisman was allegedly preparing to uncover evidence that linked the Argentine government under Kirchner to the Iranian regime in a pact to cover up Tehran's role in the bombing. One theory argues that a pact was made between the two governments, guaranteed Argentina a food-for-oil agreement to help quell Argentina's economic crisis. Kirchner's former vice-president, Amado Boudou, became the first sitting Argentinian vice-president to be formally charged with corruption. Boudou was charged with accepting a bribe from Ciccone printers, and was suspected of using his influence when he was the Minister of the Economy to ensure that a contract to print Argentina’s currency was awarded to a company he allegedly controlled. The Panama Papers has put Argentine political elites on the defensive, including President Macri. He vowed to fight corruption during his presidential campaign. The President has been found on the list of two offshore firms, one in the Bahamas, and another in Panama. Macri says the firms were legitimate operations set up by his father. As Macri vows to have done nothing wrong, investigations are bound to occur in the coming months. Political corruption in Peru remains a threat to Peru's democracy. Transparency International's 2015 report ranks Peru's corruption score at a low of 36/100, indicating that Peru also has corruption imbedded within its public sector. With the presidential elections approaching, Peru finds itself in mayhem as some, but not all, of its presidential candidates have been connected to the Panama Papers fiasco. Peru's former president, Alberto Fujimori is currently in prison for human rights abuses, corruption, and embezzlement. While in power from 1990-2000, Fujimori has been faulted for ordering killings and kidnappings by security forces. He was condemned to 25 years of prison in 2009. Prior to the latter ruling, in December 2007 he was condemned to six years in prison for charges of abuse of power. The history of corruption casts a shadow over current candidates and threatens the legitimacy of current presidential candidates, Keiko Fujimori, Pedro Pablo Kuczynski, and former president, Alan Garcia. The first round of the 2016 Peruvian presidential election took place Sunday, April 10. Although Keiko Fujimori, the daughter of former leader Alberto Fujimori, was confirmed as the clear frontrunner of Peru's first round of presidential elections, the Panama scandal can be expected to cause public outcry. The documents revealed that Fujimori, along with Kuczynski, and Garcia are connected to offshore accounts. Such exposures further add to the suspicion of whether these candidates are credible as well as raise questions regarding the future of a truly democratic Peru. Keiko Fujimori became active in the political realm upon taking the role of first lady during her father's administration, after her mother was removed for disclosing human rights abuses and corruption allegations against her husband's administration. As member of Congress for six years, Keiko was accused of being negligent while in office. Along with speculation that she would follow in her father's footsteps, teleSUR reports that the release of the Panama Papers suggests that her campaign received "dirty" money with the help of key financial bankers who concealed and laundered these funds through offshore tax havens and shell companies of Mossack Fonseca. These indictments continue to cast a shadow over the recurrent cases of corruption that continue to impede a fair electoral process in Peru. Pedro Pablo Kuczynski, former Prime Minster, Wall Street Executive, and World Bank Economist is another candidate involved in the Panama Papers accusations. TeleSUR reports that Kuczynski is accused of assisting a friend and banker in setting up an offshore shell company through the Panamanian law firm. Kucyznksi worte a letter of recommendation when he was Prime Minister for the former director of the Peruvian Central Bank. The director then used the letter to open offshore bank accounts in Panama. Kuczynski stated that he was unaware that the letter was used for commercial purposes, distancing himself from the allegations. Coming in second place after Sunday's first round of presidential elections, Kuczynski received 23.7 percent of the voter's support, qualifying him for the second round taking place June 5. Thus, his alleged connection to the Panama Papers scandal can be a critical determinant for his presidential campaign. Lastly, the former two-time president Alan Garcia was linked due to the scandal through the implication of his political party's leader in the Panama Papers. Previously, Garcia had been accused of manipulating electoral committees to kick presidential candidate Julio Guzman out of the race. On March 4, 2016 an investigative subcommittee confirmed that two candidates, Julio Guzman and Cesar Acu-a were ineligible to run for election. Since then, this verdict has raised further speculations over the transparency and justifiable electoral process in Peru. Although no further information has been released discussing the accusations made against Garcia, two of his business partners stated his link to the offshore scandal. The alleged involvement of president candidates in the Panama Papers create a sense of fraud and deception with the upcoming second round of the Peruvian presidential election. Peru as the rest of Latin America remains an object of this endemic nature of corruption. The consequences of electing leaders caught in allegations of corruption demonstrate the inability of the region to advance democratically. The Panama Papers debacle has put Panama in the eye of everyone across the world. Ivan Zarak, Panama's Vice Minister of Finance, argues that the recent publication of documents have been unfairly used to tarnish the name of Panama. In a discussion at the Wilson Center he stated that Panama is not the main player in this scheme. Zarak stated, "According to the international consortium of investigative journalists, more than 75 percent of the companies mentioned in the documents were established in foreign jurisdictions outside of Panama." Although not pointing any fingers at certain countries, he reiterated that it was a global problem, not only a Panamanian problem. Subsequently, the disclosure of these documents have shed light on the notion that the Western Hemisphere has long suffered and continues to be threatened by a series of abusive and corrupt individuals who hinder the advancement of progressive and democratic governments. The Panama Papers further shows that you almost cannot win. We do not yet know how systemic corruption is continuing to hurt the region. As evidence provided in this analysis depicts, public sectors within Latin American governments contain an alarming amount of corruption. It is imperative to reiterate that the scandal that took place just weeks ago received most of the media coverage towards the condemnation of one single country, Panama. Today, commentaries have been decreasing, but still, no actions against those implicated in the hemisphere have taken place. International policies regarding financial transparency and transnational banking system must be modified in order to comply with standards of secrecy that might trigger any kind of corruption. It is essential to keep in mind that corruption is not a new enemy in Latin America. It seems that it has become an endemic enemy to which we have become accustomed. By disregarding corruption, the hemisphere's leaders will continue to tarnish democracy in the region. Featured Photo by Margaret Scott. Taken From NewsArt. Jessica Cruz and Melanie Landa, "Country Brief: Panama," Washington Report on the Hemisphere, Volume 36, Issue 2,8. Zarak, Ivan. "Panama: Combating Banking Secrecy through Financial Transparency." Speech, Wilson Center Washington D.C., April 14, 2016. Poncy, Chip. "Panama: Combating Banking Secrecy through Financial Transparency." Speech, Wilson Center Washington D.C., April 14, 2016. Article: Courtesy Council on Hemispheric Affairs (COHA). 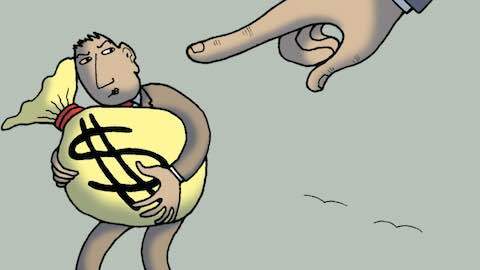 Latin America: "Redirecting the Panama Papers"